I feel like the galettes have become as ubiquitous as the cupcake; they’ve been everywhere this summer. I’m pretty sure their identity as the “lazy, easy pie” is what makes them so appealing to the masses. No transferring of dough, no crimping, no perfection needed. 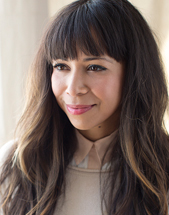 Galettes embrace the flaws and imperfection all of us need sometimes. 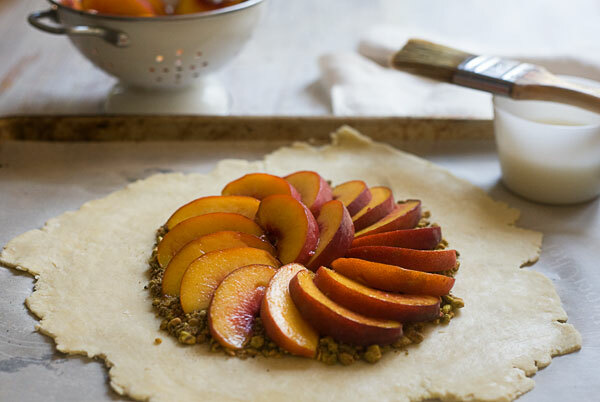 Since late summer fruit tends to be on the juicier side, a bed of pistachio crumbles keeps this galette crust from getting soggy. Crushed pistachios are tosses with sugar, coffee grounds, and a few fall spices like cinnamon and ground ginger. Coffee may seem like an odd addition, but trust me it’s so absolutely delicious. The spices, pistachios and coffee work wonderfully with very ripe, fragrant summer fruit. I think peaches might even be at their best right now. The crust might be my favorite yet. It’s an all-butter crust and instead of using all water – I mixed in a few tablespoons of apple cider vinegar. You don’t have to do this – you can keep it all water – but I think it adds a tenderness I just love. 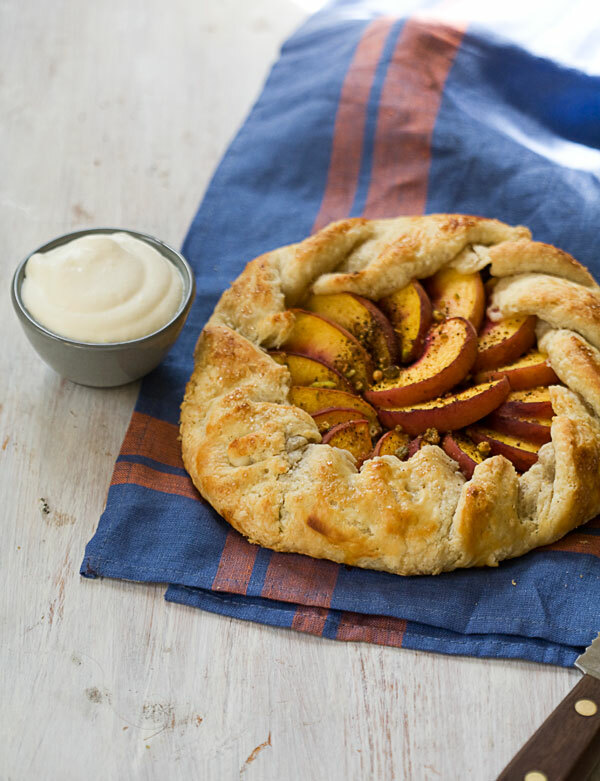 This kind of galette can only be made better with a few scoops of vanilla ice cream or a dollop or two of softly whipped cream. 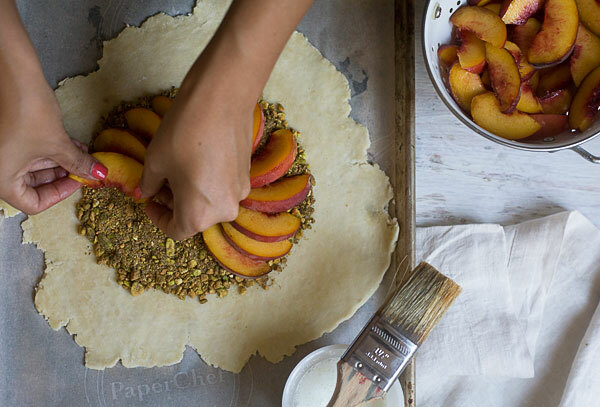 Bake this peach and pistachio galette recipe from Adrianna Adarme of A Cozy Kitchen for a fragrant dessert from the Fresh Tastes blog. In a medium bowl, combine the all-purpose flour, sugar and salt. Using a box grater (I find this the most helpful tool), grate the butter atop the flour mixture. Using your hands, quickly break up the butter into smaller bits that resemble the size of peas; toss until the butter and flour mixture are thoroughly combined. In a small bowl, mix together the apple cider vinegar and water. Create a well in the center of the flour mixture and pour in the apple cider vinegar mixture; mix using a wooden spoon or your hands. The flour mixture will be shaggy at first, but keep mixing until it begins to come together. Dust your counter or work surface with a sprinkling of flour. Dump out the dough, along with the floury bits, and knead (being sure not to over knead) until it all comes together and forms a ball. Wrap the dough in plastic wrap and transfer to the refrigerator to rest for at least 1 hour or up to 3 days. To a spice grinder or food processor, add the pistachios and pulse until they're roughly chopped. In a small bowl, mix together the chopped pistachios, sugar, coffee, salt, ginger and cinnamon. Remove the pie dough from the refrigerator and unwrap. If it's too cold to roll out (this can be the case if it's been refrigerated overnight), leave it out on the counter for 5-10 minutes. Dust your counter, rolling pin and pie dough with flour. Roll the pie dough out, rotating every so often as to avoid sticking, until it reaches a 1/4-inch thickness and is about 13-inches in diameter. (A galette is forgiving so you can eyeball these measurements.) Transfer the rolled out dough to a parchment-lined baking sheet. Spoon most of the pistachio mixture onto the center of the pie dough, leaving a 2-inch border. Smooth out the pistachio mixture so it's one even layer. 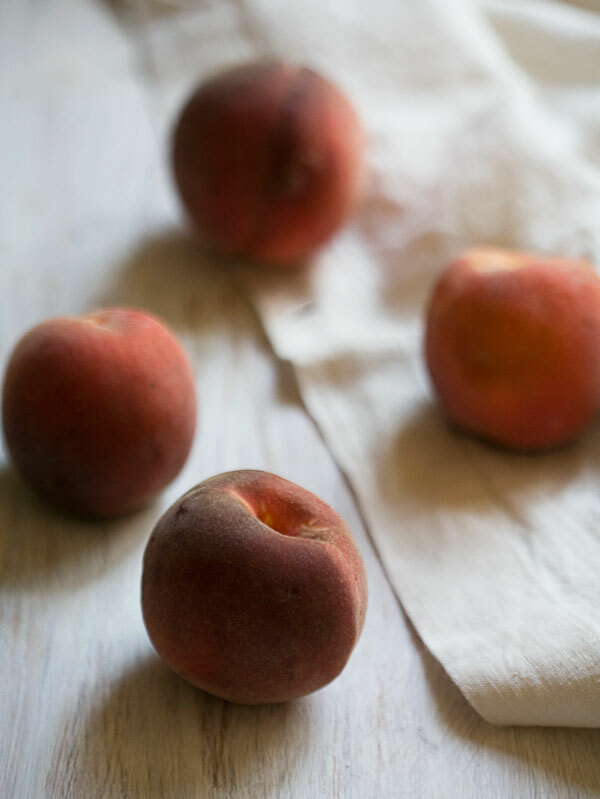 Arrange the peaches in one snug circle, placing a few peach slices in the center, if there's room. 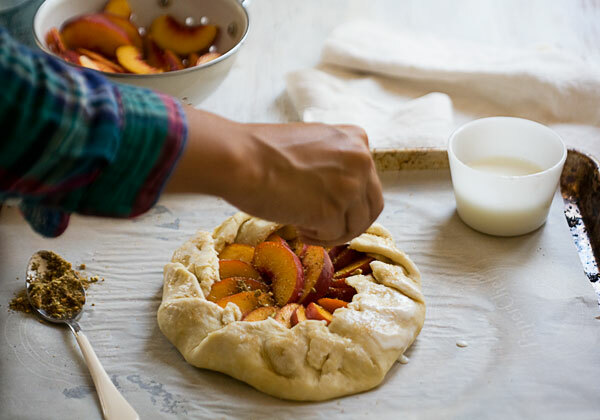 Fold the border of dough, at an angle, into the peaches, pinching the edges to make sure they're sealed. 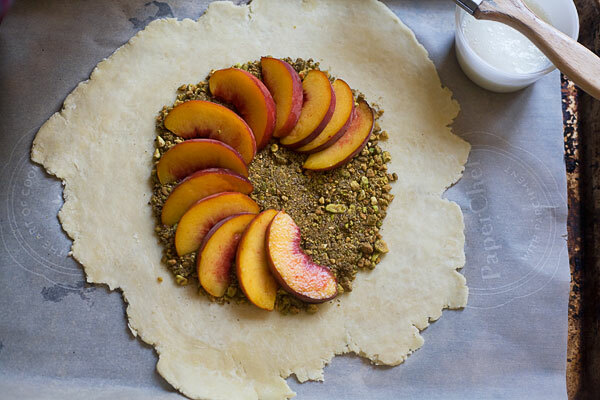 Brush the border with melted butter and top the center of the galette with the remaining pistachio mixture. Transfer the galette the refrigerator for 15 minutes, until very cold. Preheat the oven to 400 degrees F. When the oven is preheated and your galette is cold, place the galette in the oven and bake for 20-25 minutes, until the top is golden brown. Serve warm with whipped cream or ice cream.